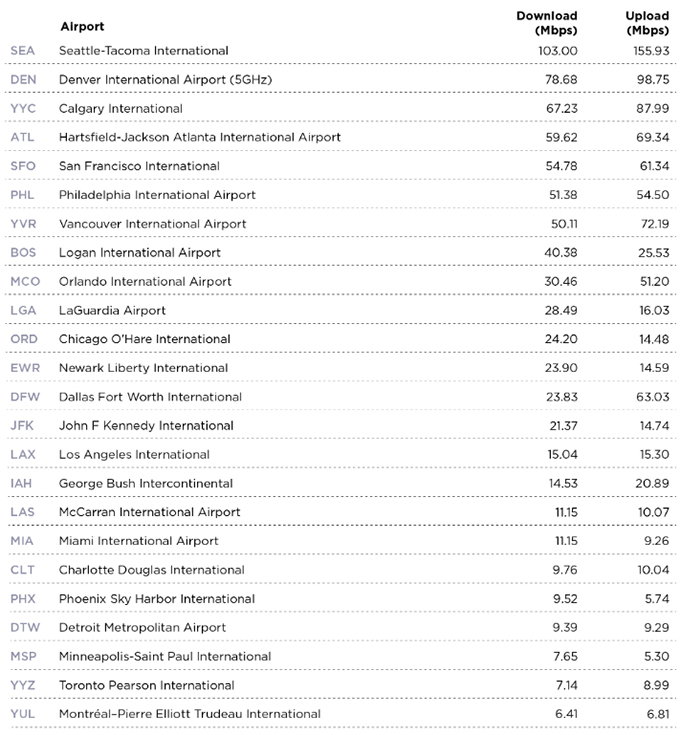 How Much Have Wi-Fi Speeds Improved at the Largest Airports inthe US and Canada? Summerâ€™s here and travelers across North America are flooding airports with suitcases and mobile devices, so weâ€™re back with a fresh look at Wi-Fi speeds in the busiest airports in the U.S. and Canada. We canâ€™t help you with the long security lines, but we can give you a heads up on whether the Wi-Fiâ€™s fast enough to keep you entertained or if youâ€™re better off wandering in search of the best coffee on each concourse. This year we looked at Speedtest results from January through April 2018 on free Wi-Fi at each airport. We then compared this yearâ€™s speeds with those from March through May 2017 as outlined in our fastest airports coverage last year. Seattle has now taken the crown of fastest airport Wi-Fi in North America from Denver, a strong contender that had held the title for two years running. Seattleâ€™s also faster than our other global winners from last year including Gold Coast Airport in Australia, Congonhas-SÃ£o Paulo Airport in Brazil, Dubai International, Seoul Incheon International Airport in South Korea, Sheremetyevo International Airport in Russia and Mohammed V International Airport in Morocco. One interesting note about Denverâ€™s Wi-Fi setup is that they appear to have separate SSIDs set up for 5 GHz and 2.4 GHz connections. The 5 GHz band is very effective for providing lots of capacity within relatively short distance and usually at faster speeds. But some older devices only operate on 2.4 GHz connections, so itâ€™s nice to see that option called out, and 2.4 GHz can provide connectivity over a longer distance which could be crucial at a large airport like Denver. With a mean download speed of 18.04 Mbps, Denverâ€™s 2.4 GHz SSID was significantly slower than its 5 GHz counterpart. We saw a similar split of service when investigating speeds at Seoul Incheon International Airport. Third place Calgary had the fastest Wi-Fi download speed of any of the airports we looked at in Canada. 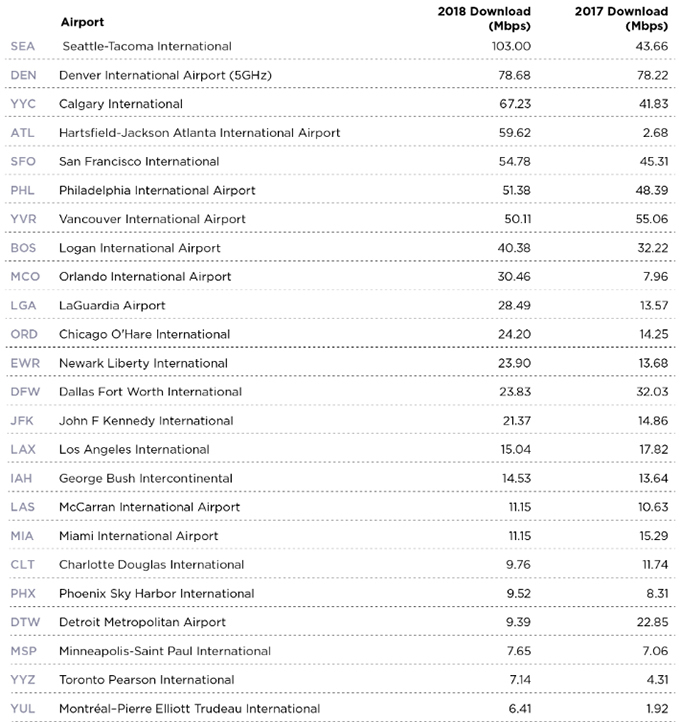 There are far too many airports on this list with a mean download of less than 10 Mbps. Free Wi-Fi is good. Free Wi-Fi thatâ€™s fast enough to keep travelers happily entertained is even better. In Atlanta, mean download speed over Hartsfield-Jacksonâ€™s free public Wi-Fi jumped over 2,124% since last year, despite being out of commission for 10 days after a cyber attack. Other airports with very impressive improvements to mean download speed over Wi-Fi include Orlando (over 282%) and MontrÃ©al (over 233%). Keeping on top of Wi-Fi improvements can make all the difference in a fast-paced world. For example though Denverâ€™s still fast, their speeds remained relatively flat while Seattleâ€™s jumped 135.9% to take the lead. What does it take to vastly improve the speeds on a Wi-Fi network? In 2014, Atlanta built a free wireless network based on 802.11a/b/g/n technology. According to Sharon Brown, Assistant General Manager of IT Operations at Hartsfield-Jackson Atlanta International Airport, the improvements we saw are related to recent implementation of approximately 1400 Cisco 3802 access points which use 802.11ac Wave 2 and m-Gig technology. This supports a higher wireless network speed and more robust wireless coverage throughout the passenger terminal. Theyâ€™re also using four Cisco 8540 next-generation Wireless LAN Controllers, operating in high availability mode and 3850XU switches with UPOE capabilities to support the 3802 access points at a network speed of 5.5G. The 3850 switches also allow for 10G uplinks to the distribution layer of the network. And three 20G circuits from the local carrier help facilitate all that passenger traffic. A professional site survey utilizing EkahauÂ® Site Survey Pro is part of ongoing efforts Atlanta is making to fine-tune their network. Orlandoâ€™s Wi-Fi network benefited from similar upgrades. Jason Gross, Assistant Manager of Networks at Greater Orlando Aviation Authority said, â€œAt the time that the Ookla report came out last year, we were in the midst of replacing our older 802.11b/g/n APs with newer 802.11ac Wave 2 APs.â€� As part of larger renovation projects at the airport, Gross said, â€œWe engaged our Wi-Fi equipment vendor, Aruba Networks, to work out a design that would provide better coverage and more consistent service to our customers. The design involves steering more clients to the 5 GHz band and implementing a high-density design to cover the 2.4 GHz and 5 GHz channels in a non-overlapping manner. This makes it more likely for a client to connect to an access point on a clearer channel.â€� The Orlando airport has also removed a 10 Mbps cap and increased their bandwidth to the internet from 1 Gbps to 5 Gbps. Orlando continuously monitors utilization to ensure they always have enough capacity to meet demand from the travelling public. Overall improvement is great, but itâ€™s also important to note that speed still matters. For example, the mean download speed at MontrÃ©alâ€“Pierre Elliott Trudeau International is still at the bottom of our list despite a massive percentage improvement. And there were far too many airports that saw declines in Wi-Fi speeds including: Detroit (58.9% decrease), Miami (27.1% decline) and Dallas Fort Worth (25.6% decline). How are the speeds where youâ€™re traveling? Take a Speedtest on iOS or Android to help us all better understand internet performance around the globe. Copyright 2018 Ookla. All rights reserved. From http://www.speedtest.net. By Isla McKetta.